Ask your doctor to show you how to do a skin self-exam . 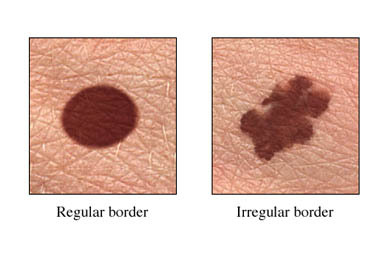 Do self-exams to look for any new or changing moles. The melanoma and some healthy tissue around it will be removed . If a large area of tissue is removed, skin from another area of your body will be needed to cover the wound. Library resources related to melanoma. The detailed guide includes descriptions of the causes, risk factors, prevention, diagnosis, staging, treatments, and what's new in melanoma skin cancer research. Health information on melanoma from the Mayo Clinic Foundation, includes: description, symptoms, causes, risk factors, tests and diagnosis, treatments and drugs, and prevention. Link to a search of the MedlinePlus database for health information on melanoma. MedlinePlus links are managed by medical librarians at the National Library of Medicine. Information on melanoma from the American Academy of Dermatology. Links to information from the National Cancer Institute on treatment, clinical trials, prevention, genetics, causes, cancer research, and screening. 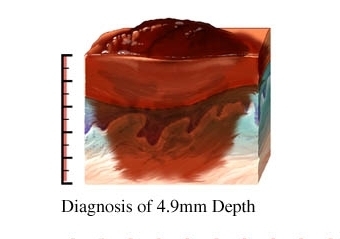 Descriptions of how melanoma looks, includes photographs. An electronic booklet about medical care for melanoma and other skin cancers from the National Cancer Institute. The booklet includes information on risk factors, diagnosis, staging, treatment, follow-up care, and cancer research.